BT Hosting is a clean and professional responsive Joomla template for hosting or online tech companies. Features of your hosting site are displayed in trendy and eye-catching design to promote your products and hosting services. BT Construction is a responsive construction and interior design template for Joomla 3.x and 2.5. Your projects are displayed professionally with impressive effects by powerful BT Portfolio component. With 6 preset colors in-built, you are freely preview the whole template. 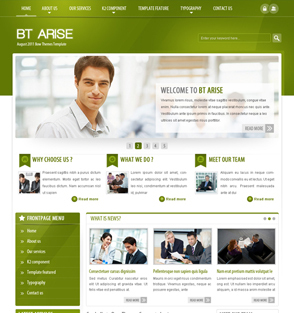 BT Arise II is the pro version of the hottest BT Arise template at Bowthemes for Joomla 3.x and 2.5. This responsive template is integrated with big components such as Joomshopping, EasyBlog andBT Social Connect. 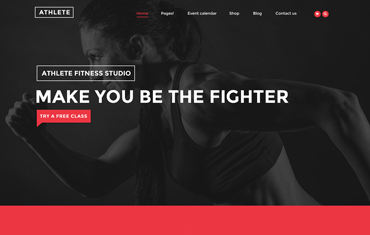 Looking for a responsive fitness template for Joomla 3.x and 2.5? BT Fitness is the wise choice forgym, sport, boxing or fitness center with energetic and modern design. BT Property is a perfect solution for impressive real estate Joomla website. The modern and flexible design of this responsive template allows users to display the listing in various beautiful layout. 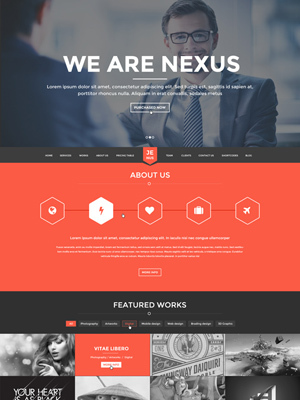 BT Jenus is an elegant and gorgeous one page template for responsive multi-purpose Joomla websites. It has an especial charm because of incredible parallax background, video background and portfolio filter module with impressive 3D transitions effect. BT Fashion is a trendy responsive template for fashion stores, built with unique Bowthemes components: BT Social Connect and BT Background. 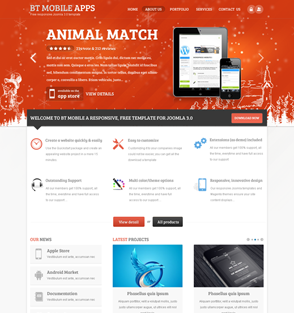 This premium theme is perfectly compatible with K2, EasyBlog and Joomshopping will fully shopping cart function. 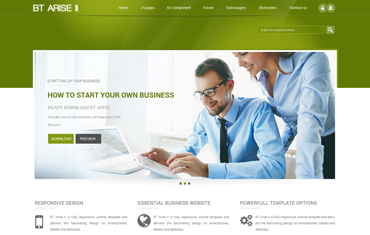 BT Business might be one of the best Joomla template for corporate uses, built with the newest Bowthemes component: BT Social Connect . 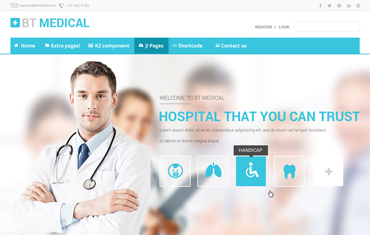 Some of the key features: responsive design, parallax scrolling, K2 and EasyBlog supports... 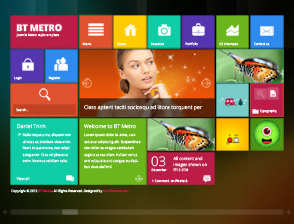 This premium theme has an creative, stylish and modern design with powerful options to easily control and customize. BT One page is a fully responsive, single-page Joomla Template with 3 polished interfaces: Corporate, Retro and Christmas styles. Editing the content is made easy with the use of BT Portfolio component and another unique extensions from Bowthemes. 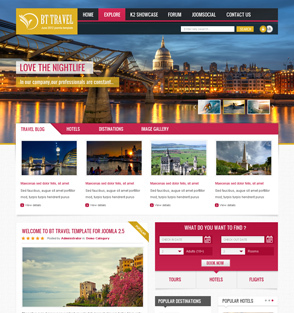 BT Magazine is latest, responsive Joomla template that fully supports EasyBlog, No1 blogging component by Stack Ideas. 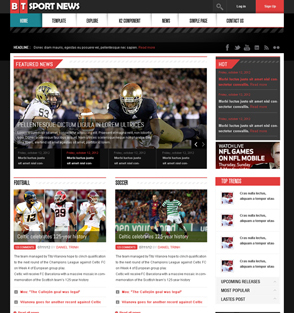 Its layout and design are modern and flexible enough to fit any digital magazine, technology blog, or online news site. BT Movies is ideal Movie Joomla Template. It boasts beautiful layout optimized for blog or small magazines. Fully compatible with J!Reviews component, this template allows you to create unlimited mini-review-pages within your main website. BT Game brings together super strong graphic styling with impressive background slideshow and smooth video presentation. This Responsive Joomla Template will no doubt best suit your requirements for online,pc gaming website. BT Real Estate shows off product catalogue to your potential customers by special Bowthemes filter module. 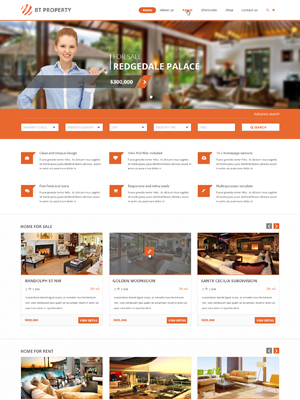 This is elegant and flexible solution for real estates, vacation rentals, automotive sale with 6 colors options and responsive layout. 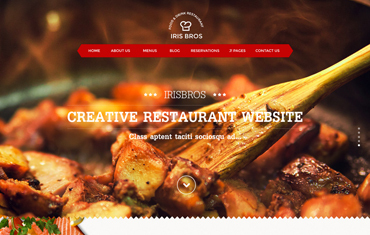 BT Restaurant is jaw-dropping Joomla Template with responsive layout, stunning slideshow and vintage typography. K2 component will help restaurant and coffee shop owner in easily showcasing their menus. 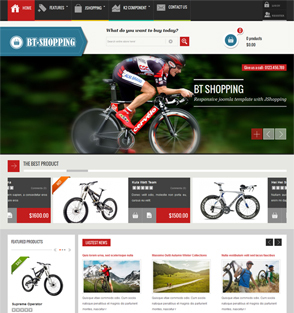 BT Shopping is Responsive Joomla template for Ecommerce website with strong and clean design. We've intentionally used JShopping component which help you easy to build a store. BT News is Responsive Joomla template for news and magazine site with strong and clean design. We’ve intentionally used BT Content Showcase module to create multi-layout on the front-end, a perfect way of imitating the dynamic information flow. BT Photography is amazing responsive joomla template for photography. It's come with six colors and many module positions. BT Photography helps photographers easily create beautiful portfolio with background slideshow and portfolio component. BT Folio is Joomla Templates for a business or a personal portfolio which includes 6 different colors and styles. 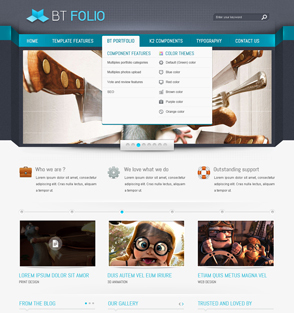 BT Folio together with Joomla! 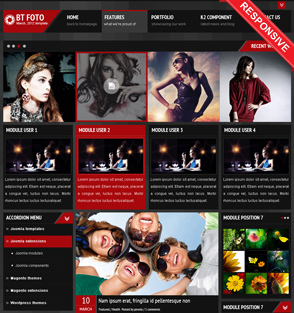 portfolio component designed to enable you to arrange your projects and present your works. 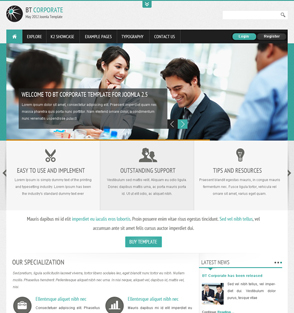 BT Variety is second template for Joomla of Bow Themes. It comes with five amazing colors and styles. BT Variety template is appropriate for building fashion shop, fashion catalog websites, the same as, e-commecial.